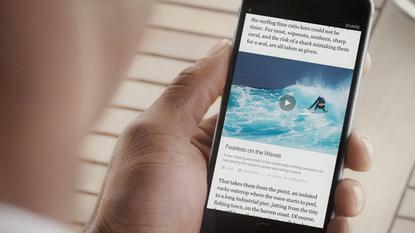 Facebook aims to speed up the delivery of news on the company's mobile apps with Instant Articles. The New York Times, National Geographic and others will use it to publish interactive articles directly on Facebooks iPhone app. People already share a lot of articles on Facebook, particularly on its mobile apps. To date, however, they take an average of eight seconds to load, by far the slowest content type on Facebook, the company said in a blog post on Tuesday. Instant Articles promises to change that with much better responsiveness. Users will be able to watch auto-play videos as they scroll through a story. They will also be able to view interactive maps, zoom in on high-resolution images, listen to audio captions, and comment on individual parts of an article in-line, as long as publishers have to added the necessary content. Instant Articles is launching on Facebook for iPhone with a special set of stories published by The New York Times, BuzzFeed, National Geographic, NBC and The Atlantic. The Guardian, BBC News, Spiegel and Bild are also on board. The two German newspapers are interesting additions, since they in the past have been critical of Google News. The German publishers felt they gave away too much of its content to Google without making any money from it. They unsuccessfully tried use a local law to get paid via abitration, and then agreed to alllow Google to publish news snippets. Last month Google said it plans to give €150 million (US$168 million) to European publishers and digital journalism startups in the next three years to support the news sector. Facebook seems to have learned from the problems Google has faced with News, and chosen a more publisher-friendly approach. Instant Articles was designed to give publishers control over their stories and monetization opportunities, according to Facebook. Publishers can sell ads in their articles and keep the revenue, or they can choose to use the company's Audience Network to monetize unsold space, it said. For Facebook the goal is to get users to come back more often to its apps, and not just to see what their friends are up to. The company didn't get off to the best of starts on mobile, but its fortunes have now changed in a big way. Last month, Facebook said it had an average of 798 million mobile users in March, up 31 percent year-on-year. That was about 85 percent of the total number of users, which grew by 17 percent. Instant Articles is yet another example of how the way news is consumed is changing, with social networks often at the center. However, they aren't alone. Verizon Communications' US$4.4 billion [b] acquisition of AOL also comes with a lot of content, including websites such as The Huffington Post, TechCrunch and Engadget. Even if Facebook and Verizon have taken different approaches, the goals are the same: make their offerings more attractive and make money from selling ads.